OEM business involves the manufacture of brand products for other companies. Our firm can manufacture products from a wide range of industries, including health, beauty, and miscellaneous products. We can provide comprehensive support for all aspects of production for new products, including planning, development, manufacture, delivery, and pricing. We are happy to offer our services to first-time manufacturers as well. then look no further than Kanegawa. Feel free to contact us with inquiries. then leave the planning and development to us. Don’t hesitate to contact us with your inquiries. Tell us about your product, distribution channel, and other pertinent details. We’re open to all suggestions. We draft a proposal and design that meets your needs based on the information provided to us. We’ll handle the packaging, label design, and everything else necessary for manufacturing your product. After receiving approval for our proposal, we’ll begin the manufacturing process. We perform all manufacturing under strict quality control standards at thoroughly inspected factories, so rest assured your product will be handled properly. We ensure product quality control and conduct inspections at every step of the manufacturing process, from the initial stages to completion. Kanegawa places a premium on quality. We can deliver everything at once or in batches according to your preferences. Feel free to inquire about international shipments as well. We will ensure that your products make it to you safe and sound. We provide sales support for products after they are planned and produced. A total range of support is provided, from various inspection procedures leading up to the sales of products to production of leaflets for sales promotions or websites. Thorough quality control and inspection are conducted to manufacture products with superior quality. Photography of models and products are performed to match the concept of product branding. A total range of support is provided aside from planning and manufacturing but also even production of sales promotional tools for sales promotions. We successfully created a health product beloved by customers of all ages for its health-promoting qualities. 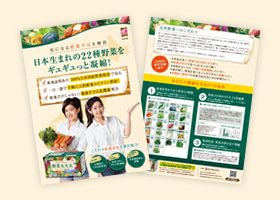 It helps people maintain a balanced diet by providing nutrients found in vegetables that many individuals lack, including FK-23 lactic acid, which assists in the prevention of cancer and infections, as well as folic acid (a water-soluble form of Vitamin B), a functional nutritional ingredient. Only domestically grown vegetables were used, ensuring that we created the highest-quality product possible for consumers. With the proliferation of smartphones in our everyday lives, many people find themselves dealing with eye strain and dry eye. That’s where this supplement comes in. It contains bilberry extract, marigold extract, and black soybean seed coat extract, known for their eye-soothing properties. It also includes Vitamin A, a functional nutritional ingredient that not only promotes eye health, but also combats carcinogens and moisturizes skin. The bottle for generating “hydrogen water”, which offers various effects that support beauty and health, has been made into a product. Microscopic bubbles of hydrogen dissolve into water to create high concentration hydrogen water in just five minutes. The functionally superior design makes the product portable and can be carried on person while walking. The image of cleanliness and femininity were stressed in planning for manufacture of the product to ensure that young women may elect to use the product regularly, as it supports daily health and beauty care.